Amitriptyline hydrochloride is a dibenzocycloheptene-derivative tricyclic antidepressant (TCA). TCAs are structurally similar to phenothiazines. They contain a tricyclic ring system with an alkyl amine substituent on the central ring. In non-depressed individuals, amitriptyline does not affect mood or arousal, but may cause sedation. In depressed individuals, amitriptyline exerts a positive effect on mood. TCAs are potent inhibitors of serotonin and norepinephrine reuptake. Tertiary amine TCAs, such as amitriptyline, are more potent inhibitors of serotonin reuptake than secondary amine TCAs, such as nortriptyline. TCAs also down-regulate cerebral cortical β-adrenergic receptors and sensitize post-synaptic serotonergic receptors with chronic use. The antidepressant effects of TCAs are thought to be due to an overall increase in serotonergic neurotransmission. TCAs also block histamine-H1 receptors, α1-adrenergic receptors and muscarinic receptors, which accounts for their sedative, hypotensive and anticholinergic effects (e.g. blurred vision, dry mouth, constipation, urinary retention), respectively. See toxicity section below for a complete listing of side effects. 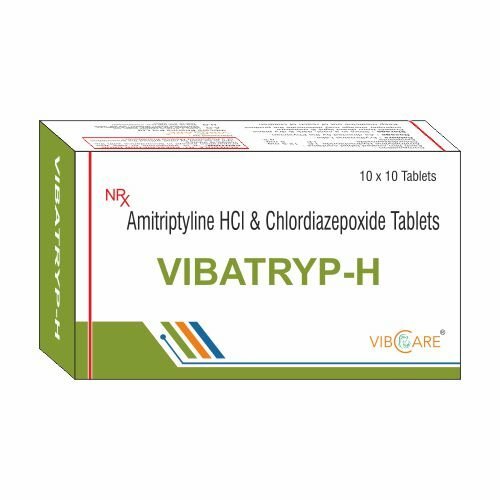 Amitriptyline may be used to treat depression, chronic pain (unlabeled use), irritable bowel syndrome (unlabeled use), diabetic neuropathy (unlabeled use), post-traumatic stress disorder (unlabeled use), and for migraine prophylaxis (unlabeled use). An anxiolytic benzodiazepine derivative with anticonvulsant, sedative, and amnesic properties. It has also been used in the symptomatic treatment of alcohol withdrawal. “LD50=350 mg/kg (in mice). Symptoms of overdose include abnormally low blood pressure, confusion, convulsions, dilated pupils and other eye problems, disturbed concentration, drowsiness, hallucinations, impaired heart function, rapid or irregular heartbeat, reduced body temperature, stupor, and unresponsiveness or coma. Side effects include: sedation, hypotension, blurred vision, dry mouth, constipation, urinary retention, postural hypotension, tachycardia, hypertension, ECG changes, heart failure, impaired memory and delirium, and precipitation of hypomanic or manic episodes in bipolar depression. LD50=537 mg/kg (Orally in rats). Signs of overdose include respiratory depression, muscle weakness, somnolence (general depressed activity). For the treatment of depression, chronic pain, irritable bowel syndrome, sleep disorders, diabetic neuropathy, agitation and insomnia, and migraine prophylaxis. For the management of anxiety disorders or for the short-term relief of symptoms of anxiety, withdrawal symptoms of acute alcoholism, and preoperative apprehension and anxiety.